Literary Rambles: ASK THE EXPERT INTERVEW WITH CHRISTINA FROM THE STORY SIREN, GIVIEAWAY OF STARTERS, A TOUCH OF POWER, AND FRACTURE, AND Random Act of Kindness BLITZ! ASK THE EXPERT INTERVEW WITH CHRISTINA FROM THE STORY SIREN, GIVIEAWAY OF STARTERS, A TOUCH OF POWER, AND FRACTURE, AND Random Act of Kindness BLITZ! Today I'm participating in a Random Act of Kindness Blitz, have a fabulous interview to share with you, and three books to give away. First, I'll announce the winner of WHAT SHE LEFT BEHIND. I've got a surprise. Simon Pulse just sent me another book, so there's two winners. Yay! The winners are VIVIEN and RACHNA! I'm picking Shannon O'Donnell who is a great friend who is always willing to share advice on blogging and her publishing contacts with me so I can try to get you guys more ARCs. And when I needed an extra beta read, she immediately offered to do it without me asking. Shannon, for my RAOK gift, I'm sending you a $20.00 gift certificate to Amazon because I know you love to buy books. I really appreciate Shannon who blogs at Book Dreaming. If you have a minute, please stop in and tell her how awesome she is! Today I’m excited to interview Christina who blogs with Kristi at The Story Siren. If you’ve never read their blog, you’re really missing out because they have a fantastic book review blog. Kristi, whose blog this is, has done so much to promote middle grade and YA books, including starting her debut author challenge where bloggers commit to reviewing at least 12 debut books. I love their blog and recommend you check it out here. Hi Christina. Thanks so much for joining us. 2. My daughter's pretty obsessed with The Hunger Games too. And all the books I read are from recommendations of friends or book review bloggers like Kristi and you. Before you started blogging, how did you find out about the books you read? What about new books coming out? I first started finding out about books at my library because every summer they have a summer reading program. Since I was going into 6th grade, they considered me a “teen reader.” Most of the books in the lists were series, so I got into teen books through summer reading. My mom has an Amazon.com account and for book recommendations, books in series come up, so that’s how I find out about books coming out. 3. You sound like an advanced reader so I can see you being drawn to teen vs. middle grade books. Tell us how you got to know Kristi and started blogging with her. 4. Wow! You have an awesome grandma. And I can totally relate to the feeling of not wanting to miss an opportunity. That's how I felt when Casey posted that she was looking for a blog partner. It's such a great opportunity that I'm glad you didn't pass it up. Me too. How has blogging changed what you read, if at all? What books are you waiting to be released? Oh man! Blogging has changed my life so much and the books I read. Before I started blogging, I didn’t read that much. I started to actually take an interest in reading books in the summer of 2011. I read 16 books that summer. At that time I thought that was a lot, but now that I think about it, it’s not a lot compared to what I’ve read now. Now, most of the books I read I usually find on blogs, or I admin on a page on Facebook called “Confessions of a Bookaholic” and if I need a book to read or can’t decide what book to read, I’ll ask the people who like it and they give me really great recommendations. The two books that I don’t think I can wait much longer for are Insurgent by Veronica Roth and City of Lost Souls by Cassandra Clare, and both come out next month!! I also can’t wait until Clockwork Princess too, but that a loooong ways away. 5. I've had a similar experience since I started blogging. I always read a lot but now what I read is governed a lot by who I'm interviewing here or what I want to give away. And I just got Insurgent from the library. Do you buy most of your book, receive ARCS, or get them at the library? How often do you go to a bookstore? I buy, well my mom buys me books quite often, but my bookshelves have become fuller because of Kristi. She’s sent about 30 books and I appreciate that so much. So most of the books I own have been given to me from Kristi. I used to go to the library a lot, like 3 times a week, but now I never go. I go to a bookstore maybe every Sunday. It all depends because my grandma will take me to Barnes and Noble sometimes after church on Sundays, but not every Sunday because their books are EXPENSIVE!!! 6. I'd love to have Kristi send me some books. She has such good taste in books. And I don't go to the library as much either. I do miss that. I know you must read some blogs because you found Kristi and The Story Siren. Which ones do you read regularly? Do you read any teen book blogs, author blogs, or author or publisher websites? Become a fan of an author on Facebook? Why? I have a couple blogs that I keep up on everyday because I sign up to get e-mails of their posts. So, I look at a Mortal Instruments Series blog (catch the theme? I love those book!) I also look at the YA Sisterhood. I like a lot of blogs and authors on Facebook. I like Willow Cross, Michelle Warren, and Lauren Kate. 7. Have any of your teachers recommended any blogs or websites to your class or to you? No, not really. They don’t really do that, but I think they should because we have so much technology. My school corporation just gave kindergarten through first grade iPod touches, the second through fourth graders get iPads, and fifth grade through high school get laptops. I think they should recommend blogs to my class though. 8. Wow! That's awesome that your school gives kids all that technology. I wonder if your language arts teachers in middle school will start suggesting blogs or websites for you to check out. You'll be able to recommend some to your teacher, including your own blog. I bet they'll be impressed. Are there things your favorite authors could do that would make you more likely to visit their website, their blog, or become a fan on Facebook? Oh yes! If the second book came out less than a year from the first one!! I know they can’t do that but there have been some books that I have read and they just leave you hanging and you’re like “What?!?! I need the second book now!” and it doesn’t come out for like two years. If I’ve read their book and I love it, then I’ll definitely get on their blog and follow them and like them on Facebook. 9. That's great to know that you'll check out the author's blog and Facebook page. Most of the kids I've interviewed wouldn't do that. Have any authors visited your school? Who? Is there anything you’d recommend that an author do to make their presentation more interesting to you and other kids at your school? Don't worry, you're not weird. You're really cool. And I found my daughter and her friends really started getting excited about books in middle school and now high school. So there's hope your friends will catch up to you. Thanks Christina for sharing all your advice. Next here are the books I'm going to give away today. If you click on the title, you can read the description from Goodreads. First I'm giving away Lissa Price's debut book STARTERS. 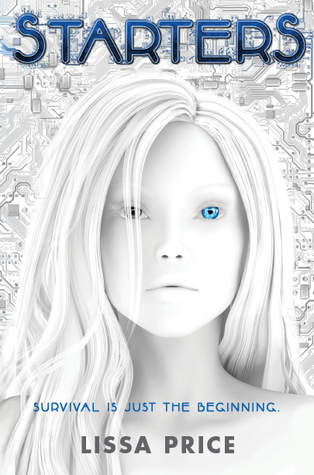 Lissa Price has created an amazingly unique dystopian world filled with mystery and hard choices. This world has only kids under 20 years old and who have no rights and people 60 and older who live to such long lives that they do all the work because everyone else has died. And the fact that the people older than 60 can rent a teenager’s body is one of things that makes the story so different. Callie is such a great character—very independent yet vulnerable in her fierce protectiveness of her younger brother Tyler. And it’s because of her love for Tyler and her desire to save him that she decides to let someone rent her body. As creepy as the idea of renting your body is, it was fascinating seeing all the secrets and mysteries Callie uncovers while she let an elder rent her body. I couldn’t put the book down. It was so full of twists and mysteries I wanted to figure out. I can’t wait for the sequel. 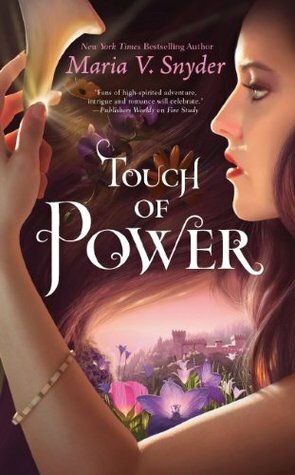 Second up is TOUCH OF POWER by Maria Snyder. I’m a huge fan of Maria Snyder and was so excited when I won Touch of Power. Avry is a strong, compassionate main character who has been living on the run alone. When she’s kidnapped by Kerrick and his band of helpers Loren, Quan, Flea, and Belen, they want her to heal Prince Ryne. But there’s a problem. She hates him and refuses to cooperate. It was fascinating watching her relationships change with her captors as they journey across the Nine Mountains to where Prince Ryne is hidden. The world Maria Snyder creates is rich and there are many mysteries uncovered, including Avry’s relationship to her family, who is good in the fifteen kingdoms, why she hates Prince Ryne, and who Kerrick really is. This is another one that I’m anxiously awaiting the sequel. 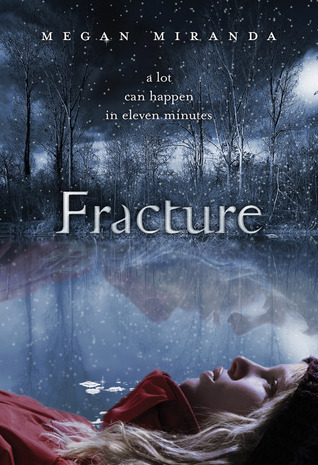 And the last book is FRACTURE by debut author Megan Miranda. This was an interesting mix of contemporary with perhaps a slight paranormal ability. I found this to be a really fast read. Delaney falls into icy pond while walking with her best friend Decker. He pulls her out but not before she dies. And she stays dead for eleven minutes. When she comes too, everyone is amazed that she shows no effects of being brain dead. And they try to go back to normal. But Delaney knows something's different. She now can sense death. And she meets Troy, a 19-year-old boy who also survived a coma. I enjoyed watching Delaney take charge of her life in ways she hadn't before as she tries to come to terms with what it means to come back from death and figure out where Troy and Decker fit into her life. So there will be three winners. To enter, all you need to do is be a follower (just click the follow button if you’re not a follower) and leave a comment on Christina's interview by midnight on May 28th. If you have a preference on what book you'd like, leave that in the comment too. I’ll announce the winner on May 30th. If your e-mail is not on Blogger, please list it in your comment. International entries are welcome. Want to win a fabulous YA mystery with a touch of paranormal or an awesome new middle grade mystery series? Enter my giveaway for Kim Harrington's new books. There's going to be 3 winners. The link is at the top of the blog. Here's what's coming up next. On Wednesday, I'm participating in debut author Misty Provencher's blog tour for her debut book CORNERSTONE and giving away two copies of her books. Then next Monday I'm interviewing debut author Marissa Burt and giving away an ARC of her middle grade fantasy STORYBOUND. Wednesday next week I'll be interviewing Stephanie Guerra and giving away an ARC of her YA book TORN. I'd like to win Starters by Lissa Price. I follow via GFC as Becky. Congrats to Shannon. I'm heading over to her blog. And can't wait to get hold of my copy of The Emotional Thesaurus! Great interview with Christina - she's got great taste in books! Shannon is such a sweetheart! Fantastic choice! Oops. Forgot...Christina, it was fabulous meeting you!! So many wonderful things in this blog post, Natalie! I love Shannon's blog, too - she's great about carrying on a dialogue with her readers. The Emotion Thesaurus at The Bookshelf Muse is a wonderful resource - I've been looking forward to their official book launch. ROAK is a perfect idea for them. Congrats to Christina for stepping up to the big blogging opportunity with Kristi! Great shout-out to library summer reading programs. I did this growing up, and then got my own daughter involved from the time she was a toddler. I'm always surprised how many kids/parents don't know about these programs. I agree, Shanoon is awesome and amazing. Shanoon should of course be Shannon. WOWZA!!!! You are soooooo sweet, Natalie! Now you want to know what's really cool about this? You're MY RAOK shout-out too!!! How funny is that? Yay! Love that you chose Shannon. Thanks and congrats to the other winner!! Great interview! Just in the short time that I've been following blogs, I've noticed a huge change. There has been so much drama...it's all so very interesting from an outside perspective. The amount of Meme's has slowly decreased, thank god. I love the spotlights on the authors. I find out about so many new ones every day. You're so awesome!! You give and give and give. :D Hope you have a wonderful week and receive lots of kindness yourself. Wow! Thanks a lot, Natalie and Casey for the book. I am thrilled. I will go and meet Shannon. She sounds like a sweetheart. YAY Shannon and HI Christina (I am amazed at all the technology available at school)! Love the kindness celebration today! The interview was interesting; I enjoy hearing students' viewpoints! And more giveaways--wow, Natalie!--there's a lot going on here today! Shannon is awesome, especially her profiles on Middle Grade books. Great interview. Congrats, Shannon--a worthy recipient :). And thank you, Natalie. You've been busy today, popping around to the various RAOK participants, and I appreciate you spreading the love! Congratulations to Shannon. Yes, she's a sweetheart! Great interview, Natalie and Christina. Always love hearing the perspective of a 12-year-old blogger and reader. No surprise that they all love Hunger Games! We're selling more of that trilogy than anything else right now. I've read STARTERS, and raced through it. Pretty decent read. I'm curious about FRACTURE, though. AWESOME interview! LOVING all the RAOK love!! Shannon is like my own personal cheerleader. I can't tell you how much knowing her has kept me on the writing path. Great choice! Shannon really is great isn't she? And you too! Have a great rest of the RAOK day! If this wonderful person can procure ARCs, she MUST be fabulous. Great post Natalie, isn't this fun? I'm going to visit Shannon's blog now! wonderful interview and great giveaway. I would like to win fracture. Thanks! Thanks for the giveaway. I'd like Starters. Great interview! I would love to win Fracture. Thanks for the chance to win!! What a great post! Shannon is definitely terrific. And I'll have to check out The Story Siren. So much to look forward to in the coming weeks! That's so sweet Kristi took her under her wing and got her into blogging. I would love to win Starters. Thanks for the giveaway! I liked Christina's point about book trailers maybe drawing in more kids to reading. Give them a visual. A great selection of books. Great interview!! Thanks for the awesome giveaway! Not entering the contest, but just wanted to leave a comment for Christina! She is such a fabulous person and reminds of why I love reading so much! Hi! I'd choose Starter by Lissa Price if I win. Thank you for the giveaway! I followed thru GFC on the name Michelle Sedeño. Thanks for the giveaway! I would choose Fracture. Thanks for the giveaway! I already have a copy of Touch of Power, but Fracture looks really good! Christina sounds awesome! would love to meet her! I'd love to win Starters. forgot email addy...I think I need a nap. I would love Starters or Touch of Power. Interesting interview and of course thank you for the giveaway. It's really cool that Christina is so young and blogging already! Awesome! Great interview and I look forward to seeing more of her posts on the Siren. I'd love to win Touch of Power. Christina and I share a passion for Hunger Games! Great interview! I'd love to win Starters! Thanks! I haven't read any of the books yet, but I've heard awesome things about them! Thanks for the interview, great read! I'd love to win Fracture ^^ Thank you for the giveaway! Fracture has been on my radar for a while now. The other books look interesting, too. Great interview. As always, I love your site!